Discussions of the “digital divide” often touch on race and ethnicity – and the narrative is often that whites lead in technology adoption while other racial or ethnic groups struggle to keep up. But a new analysis of four Pew Research Center surveys conducted in 2015 finds that this isn’t true for one group: English-speaking Asian Americans adopt a number of common technologies at rates that exceed the rest of the population, including whites. It’s important to note that the figures reported here are based on surveys conducted only in English (and Spanish for non-English-speaking Hispanics); they do not include non-English-speaking Asian Americans. Our 2012 survey found that among all Asian Americans, 63.5% say they speak English “very well,” including about half of immigrant Asians. 1 95% of English-speaking Asian Americans use the internet. English-speaking Asian Americans have long led other racial and ethnic groups when it comes to internet adoption, and that trend continues to hold true: This analysis shows that 95% of English-speaking Asian Americans reported using the internet in 2015, compared with 87% of whites, 81% of blacks and 82% of Hispanics. 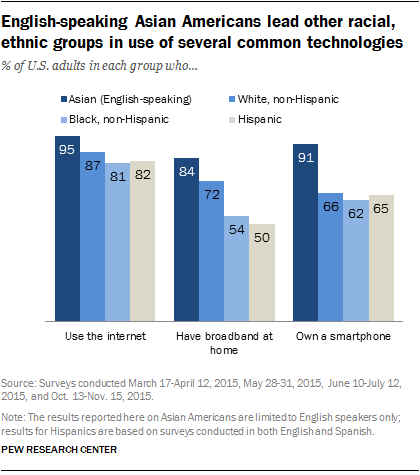 284% of English-speaking Asian Americans have broadband service at home. The level of adoption of home broadband by English-speaking Asian Americans is nearly 20 percentage points higher than that of the overall population (67%) and is also higher than those of whites (72%), blacks (54%) and Hispanics (50%). Overall, home broadband use in the U.S. has plateaued in recent years after rising steadily since 2000. 391% of English-speaking Asian Americans own a smartphone. Smartphone ownership among English-speaking Asian Americans has increased by 20 points in three years, from 71% in 2012 to 91% last year. By comparison, 66% of whites, 62% of blacks, and 65% of Hispanics are currently smartphone owners. Cellphone ownership overall is near ubiquitous among English-speaking Asian Americans: 98% own some type of cellphone (whether a smartphone or a less advanced cellphone), compared with 90% of whites, 92% of blacks and 93% of Hispanics. One reason English-speaking Asian Americans are adopting these technologies at higher rates may be their high levels of educational attainment and household income relative to the rest of the population. Both factors are tightly linked with technology adoption rates. In addition, as noted above, the figures reported here are based on surveys conducted in English only among samples of Asian Americans. While Pew Research Center has not conducted surveys of Asian Americans and their technology use in languages other than English, surveys of Hispanics indicate that English-language proficiency is highly correlated with the use and adoption of various technologies. The analysis in this blog post is based on four Pew Research Center surveys conducted March 17-April 12, 2015; May 28-31, 2015; June 10-July 12, 2015; and Oct. 13-Nov. 15, 2015. The May survey was not included in the analysis of English-speaking Asian Americans with broadband at home. The table below shows the number of surveys and interviews conducted for each subgroup of Asian Americans respectively, as well as the margin of error for each sample.